France in London | Terrorist attacks: what next? The three terrorist attacks which took place in France, Kuwait and Tunisia on Friday 26th June, killing over 60 people on three continents, are raising some highly important questions. What should Western governments do? Are the Maghreb and the Middle East no-go zones for Westerners? What is the most effective weapon available to combat Daesh? In France, Yassin Salhi, 35, beheaded his boss and tried to blow up an Air Product factory, leaving two people injured. About two hours later in Kuwait City, a suicide bomber attacked Imam Sadiq’s Shiite mosque during Friday Prayer, killing 27 people and wounding more than 200 others. And just before noon local time, in Sousse (Tunisia), the young Tunisian Seifeddine Rezgui calmly shot tourists on a packed beach and at the Imperial Marhaba Hotel where in total, 38 people died and 39 were injured. It seems quite unlikely that the three attacks were coordinate and for the moment, Daesh only claimed two of them (in Kuwait and Tunisia). However, the attacks took place just a few days after the jihadist group encouraged its followers to “take up arms against unbelievers” during Ramadan, which started on 18th June. This is actually one of Daech’s main strength: it no longer needs to place precise orders, because its supporters act on their own, choosing their targets and organising their attacks alone. Without having been to Syria, Iraq or Yemen – where Daesh currently controls large territories. Why would anyone want to commit these atrocities? 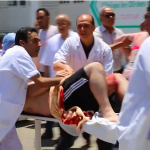 In Tunisia, the gunman actively targeted tourists, sparing Tunisians. But beyond the most direct victims, his murderous act was deliberately aimed at weakening the Tunisian democracy as a whole by destabilising its country’s economy. As many as fourteen percent of its revenues come from tourism. After what happened at the Bardo in March when 22 people were killed and 45 injured, Tunisia is now internationally thought of as a dangerous destination. This perception was strengthened by increasing criticism of the government’s promised security package, which failed to neutralise the gunman who went on a rampage for almost 30 minutes in Sousse. Among the 5 million Tunisians working in the tourist sector, an important number will inevitably lose their job in the coming weeks. And who benefits from a high unemployment rate? Daesh, of course. The radical Sunni movement takes advantage of poverty to enrol young minds that lack guidance and support. Faced with this alarming situation, Prime Minister David Cameron called for international cooperation. “We’ve got to do all we can to help”, he said. “That means cooperating on counter-terrorism, building our capacity on counter-terrorism; it means dealing with the threat at source […] and more important than anything, we have to deal with this poisonous radical narrative that is turning so many young minds. And we have to combat it with everything that we have”. Tunisia’s president Beji Caid Essebsi agreed, declaring: “all democratic countries must now join forces”. Join forces and fight? Certainly. But now Western governments need to come up with a strategy. And it had better be solid, because Daesh is potentially one of the most dangerous enemies they have ever fought against. If the necessity to act is beyond debate, one major question remains unanswered: should we – people living in Western democratic countries – continue to spend holidays in Maghreb and the Middle East? The images of panic and the testimonies of those who were there during the attack have gone around the world, instilling fear in the West. Numerous tourists have fled Tunisia since last Friday. But our exodus from the countries subject to terrorist attacks would make Daesh’s progress easier by increasing unemployment rates and poverty. So shouldn’t we try instead to support local economies, ignoring the fear terrorists are trying to spread? Daesh targets everyone: Muslims and non-Muslims, Arabs and Europeans, tourists and locals. It will doubtlessly be behind some other atrocious attacks. But the locals living under the group's control endure everyday hostage takings, torture, bombings, arbitrary ruling and terror. Letting fear prevail means encouraging the triumph of extremism.